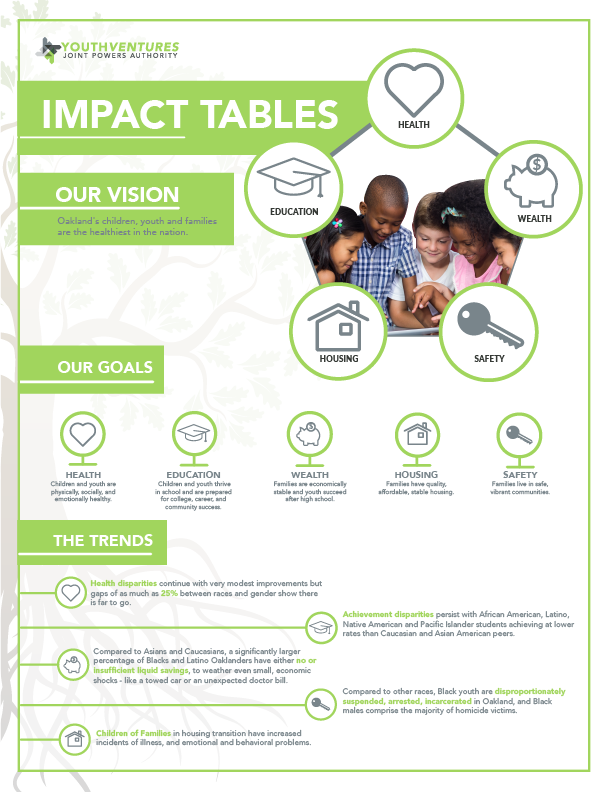 The creation and work of the Impact Tables were born out of a co-vision between the Youth Ventures Joint Powers Authority (JPA) and the Oakland Thrives Leadership Council (OTLC). The opportunities for change and improvement are found in the impact areas of Health, Education, Wealth, Housing and Safety. The purpose of the Impact Table work is to develop comprehensive systems change recommendations, and present these to the JPA Trustees for consideration and possible implementation. The ground work and templates for conducting and managing the Impact Tables were developed through a collaboration between FSG Consulting and Kaiser Permanente. (Impact Table Toolkit). The data and strategic activities from the first phase of work can be viewed in the Impact Table Mid-Phase Overview. The latest update on indicators can be found in the Oakland Citywide Dashboard. The Impact Tables form the vehicle for doing cross sector work to improve outcomes for our children, youth, and families. These tables also reveal the opportunities for alignment across impact areas and form the best expression and exercise of the collective work supported by the JPA and OTLC. Looking through an equity lens, the Health Impact Table is focusing on three areas; Mental Health and Wellness, Health Access (including electronic health records) and Healthy Food/Healthy Families. The goal is to reframe and align programs for collective impact across the three working groups and the other Impact Tables. Recently, Healthy Food/Healthy Families launched in Fruitvale/San Antonio anchored at Garfield Elementary School. In a positive approach to healthy eating, a multi-agency collaboration leveraged resources to install bottle filling hydration stations in every Oakland public school to encourage drinking more water. Together the working groups are taking an integrated approach including the nonmedical needs of children, youth and their families that impact health outcomes. The Education Impact Table strives to align key local programs, agencies and initiatives in service of improved educational outcomes for all of Oakland's youth. To do so, the Education Impact Table has built capacity in the form of four working groups addressing the following areas: (a) Early Childhood Development; (b) College, Career and Community Readiness; (c) Post-Secondary Enrollment & Persistence; (d) Business Partnerships and Career Readiness. Existing initiatives and services related to the economic security of youth in Oakland has set the stage for robust alignments and partnerships. In response to the current environment of resources and challenges for the critical measurement of economic well-being, the Wealth Impact Table has defined two major focus areas: (a) increase youth employment; and (b) increase capacity for asset building. The opportunities to keenly examine persistent factors of inequality in wealth through a number of lenses is needed to address generations of economic inequality. In addition, the Wealth Impact Table is now deliberately resourced to focus on the specific needs of our marginalized and economically vulnerable youth. With this dedicated support, there is the chance for the creation and implementation of targeted and strategic policies which could mean bridging persistent wealth gaps for consistently impacted populations. The Housing Impact Table is made up of housing professionals, agency department heads, elected officials, and other policy professionals. The work of the Housing Impact Table is focused on improving three indicators related to housing. Those indicators include the number of homeless individuals, overcrowding in households, and rent cost burden. The Housing Impact Table chose the goal of eliminating youth/family homelessness. From November 2017 through February 2018, the Safety Impact Table conducted a series of community listening sessions to hear directly from residents about their priorities and solutions related to reducing violence and incarceration in Oakland. Feedback gained through those sessions has informed the strategies Safety Impact Table members are reviewing and considering for recommendation to the JPA. Recommendations made to the JPA in December 2018 will be informed by community and evidence based, and they will be aimed at achieving reductions in the following indicators: 1) suspensions in OUSD; 2) juvenile arrests; 3) homicides; 4) robberies, larcenies, and burglaries. Funding for the Impact Table Project Managers was generously provided by Kaiser Permanente Northern California.